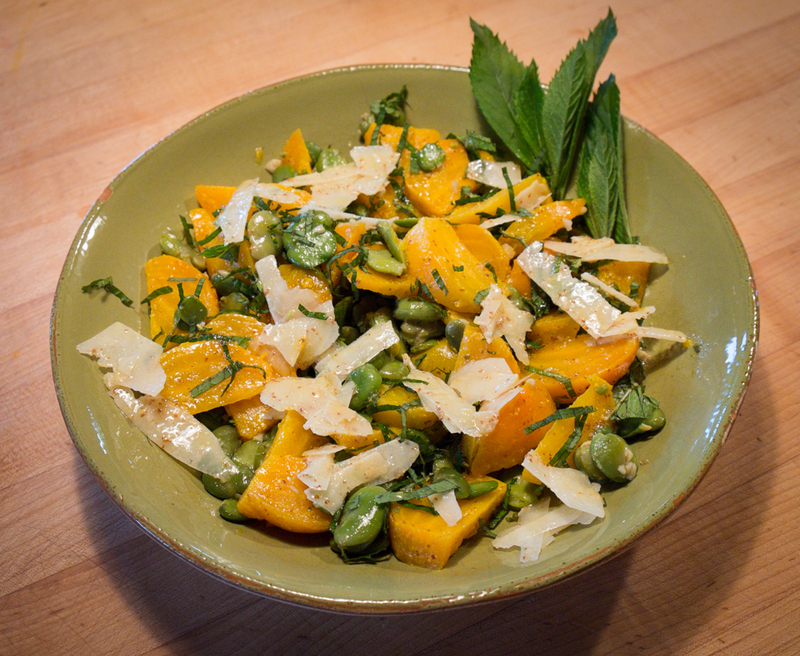 Two years ago this month I started writing Lopez Island Kitchen Gardens blog. Thank you all for your enthusiasm and encouragement as I’ve posted stories and pictures about what I’ve been doing in the garden and the kitchen. Your responses online and in person have been one of the biggest pleasures of writing this blog. When I began this blog I wasn’t sure where it would take me. What would it be like to write regularly about gardening and cooking, two activities that have been constant pleasures in my life for years? I’m pleased to say that this blog has turned out to be a very satisfying way both to stop and think about what I’m doing and to figure out how to share my experiences and discoveries. Many of the posts I’ve written have given me the opportunity to focus on growing, harvesting and cooking a single vegetable. Having an excuse to pull out gardening books and seed catalogs, old article files and new Internet resources has been a wonderful way to review and build on years of lessons taught by trial and error. 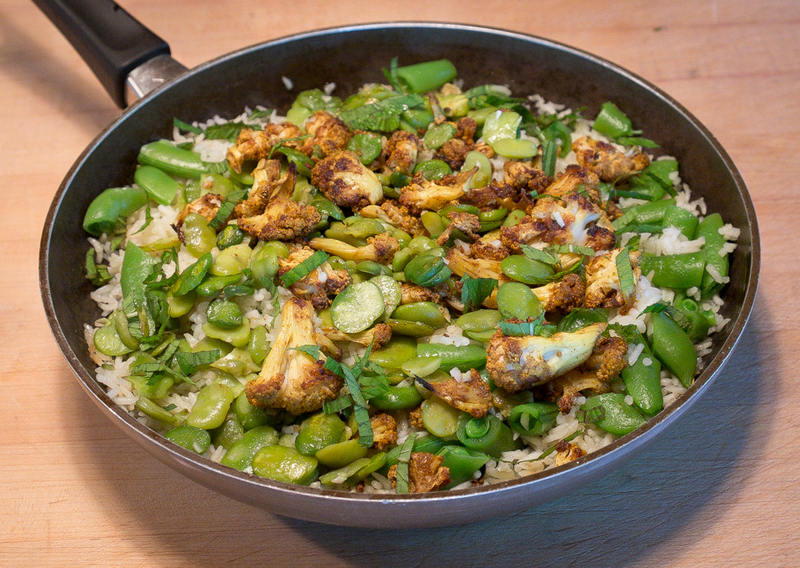 The pleasures have been the same in the kitchen, revisiting favorite recipes, techniques and cookbooks, experimenting with new ways to prepare vegetables, often inspired by current ideas from favorite cookbook authors and food columnists. There are so many engaging food and garden writers. It’s been a treat to make the time to read them regularly. In addition to vegetables I’ve written about garden planning and about the infrastructure that underlies the garden. Seed ordering, planting calendars and seed starting begin each gardening year and irrigation, mulch, bean and pea structures, bug and bird barriers and protection from cold, heat and wind all help the plants thrive. Figuring out how to share what I’ve learned from experience and research has been satisfying too. The question “What do I want people to learn?” is left over from my years as a teacher but it continues to help me focus, to select what’s important and let the rest go. Writing a first draft and revising and revising again until I’ve found what I really want to say are processes I deeply enjoy. And then there are the photographs! WordPress makes it so easy to insert images into the text, color photographs to illustrate stories about a beautiful vegetable, delicious meal or piece of garden infrastructure. From the beginning of this blog, my husband Scott has provided exquisite photos. And yes, we do get to eat all the food he photographs. 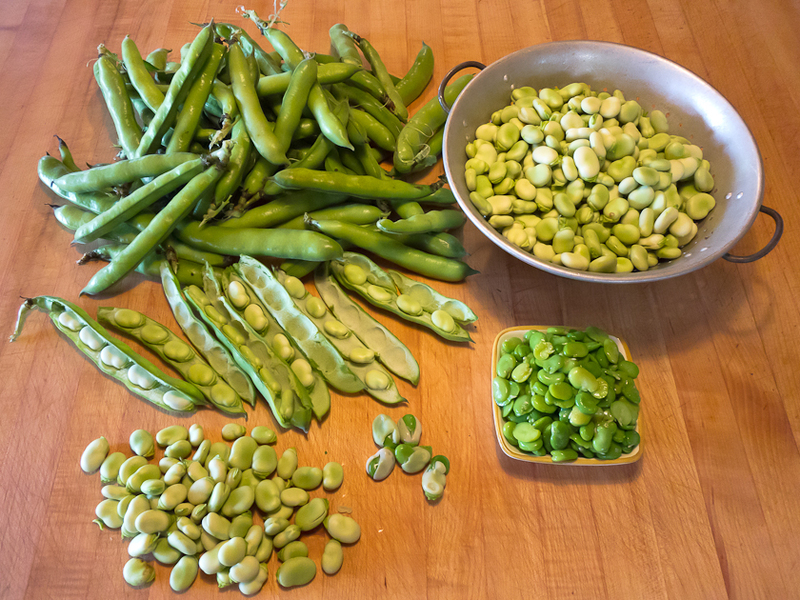 Finally, I’ve discovered that writing this blog has been a way to think more about what it’s like to be in the kitchen garden and at the table in all of the seasons of the gardening year. As I reread two years of posts, I noticed how often I referred to light, to the gradually lengthening days of spring, the long days of summer sun, the early dark of fall and winter as background to the vegetables I was planting, harvesting or cooking. 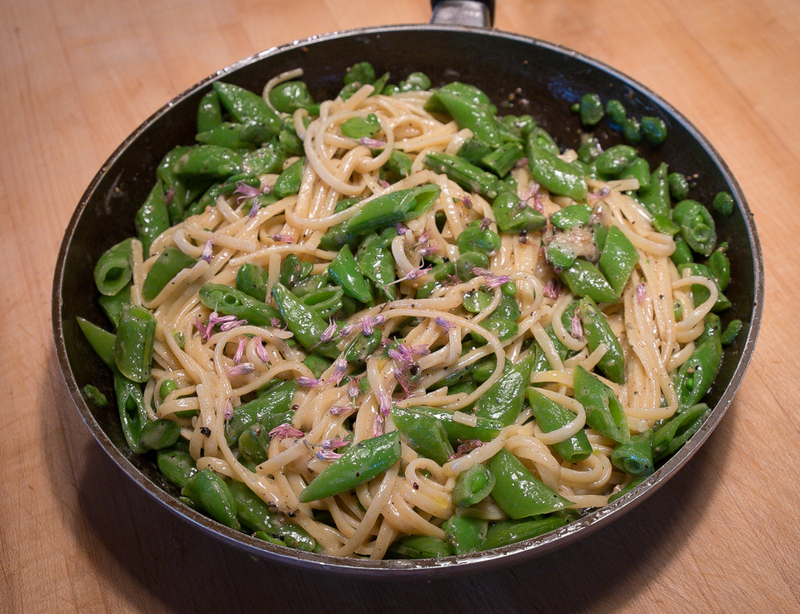 Kale buds, asparagus spears, early lettuce welcome the growing light of spring, dinner plates full of fresh green and the beginning of a new planting season. Tomatoes, peppers, eggplant, green beans highlight long, warm days and evenings, summer dinners of sliced tomatoes, crisp peppers, caponata, sweet beans. Root vegetables mark shortening days, harvesting in nearly dark late afternoons and sharing hearty dinners indoors, blinds drawn and candles illuminating the table. Looking back on these posts I’m also struck by how quickly the year in vegetables goes by. But writing this blog has also slowed down the garden year, giving me the chance to notice and enjoy the vegetable markers of each subtle change. I hope I’ve given you the same experience. To make it easier to find posts on different topics, I’ve created new categories on the right hand side of the blog under the heading Browse by Subject. Just click on Spring Vegetables, Summer Vegetables, Fall/Winter Vegetables, or Garden Planning and Infrastructure to find the posts on each of these topics. WordPress also makes it easy to search the entire blog for specific topics. Just type a topic into the Search box on the upper right hand side of the page above the garden photo and click the Return key. Or just browse the blog by month. I’ve planted beets three times so far this season, once in April and twice in May and will do one more planting soon to take us into fall and winter. Because there are so many creative and tasty ways to prepare beets, I like to have a supply for each season. This year I grew a red, Kestrel, and a yellow, Touchstone Gold, for spring and summer beets and I may just plant the same two for fall and winter. 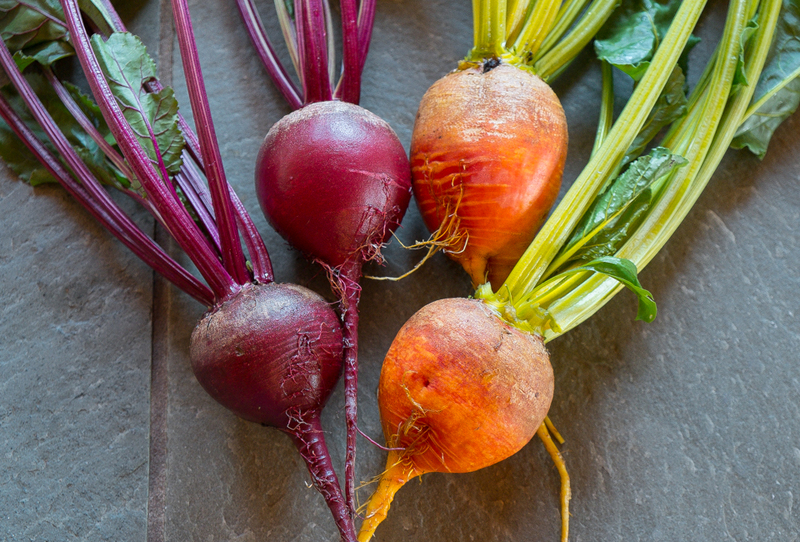 Kestrel is a dark red beet with an earthy beet flavor and dense texture; Touchstone Gold has a slightly more delicate beet flavor and more tender flesh. 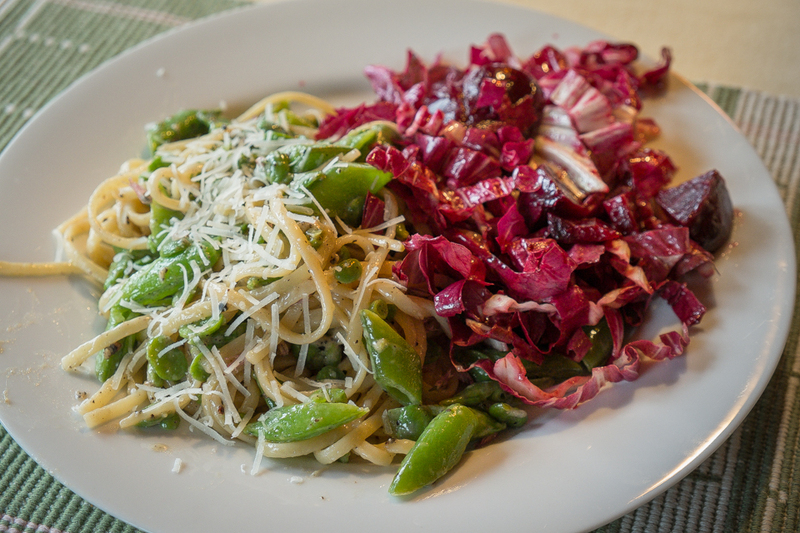 In addition to their contrasting flavors and textures, their colors make a lovely pairing on the plate. I’ve already harvested and cooked the last of the April planting and the first May planting is ready. With this summer abundance of sweet, colorful beets I’ve been making salads. If I have cooked beets on hand, I’ll add them to greens or to carrots or fennel for a vegetable salad but for something even speedier, I’ll grate raw beets to add to salad greens or to serve on their own. I use a box grater or the julienne blade on the Cuisinart. The crisp shreds of raw beets are a nice change from the softer, denser texture of cooked beets and the sharpness of vinegar or citrus in the dressing balances the heavily sweet flavor of beets. So many flavors go well with beets and salad dressings and vinaigrettes take advantage of this versatility. 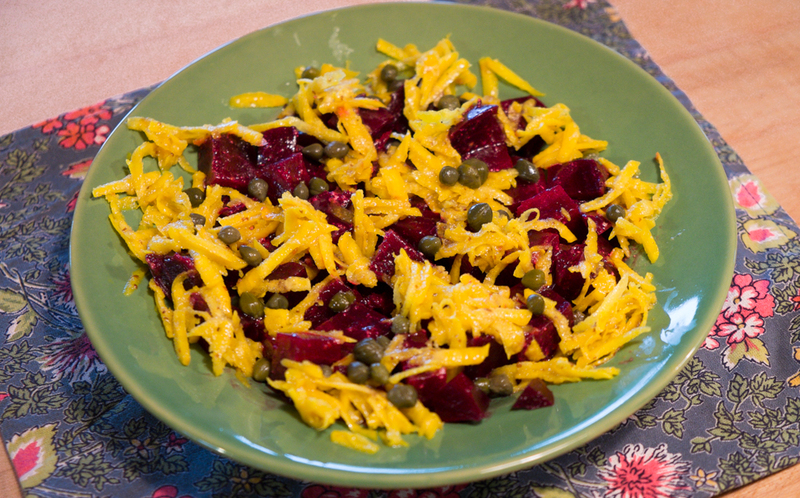 The other night I added mustard vinaigrette to shredded yellow beets and used them to garnish cooked red beets. Another night, I made the Grated Raw Beet Salad with Star Anise from Deborah Madison’s Vegetable Literacy. Star anise flavors the cider vinegar and olive oil vinaigrette and whole anise seeds mix into the grated beets. I also added some fresh anise hyssop leaves and blossoms. All these anise flavors add a spicier sweetness to the solid sweetness of beets. Peel the beets with a paring knife or vegetable peeler unless the skins are clean and fresh. Grate on the large holes of a box grater and transfer the shreds to a bowl. (If using red beets with other colors, wait to add them as they stain the whole salad red.) Combine the vinegar with ¼ teaspoon salt, onion, sugar, star anise, and olive oil. Mix, let stand for several minutes to dissolve the salt and sugar, then pour the dressing over the beets and toss with the anise seeds. Chill well. Taste for salt. When serving the beets, pick up the shreds with a pair of tongs and let the juice flow back into the bowl. Citrus provides more contrast with the beet sweetness. 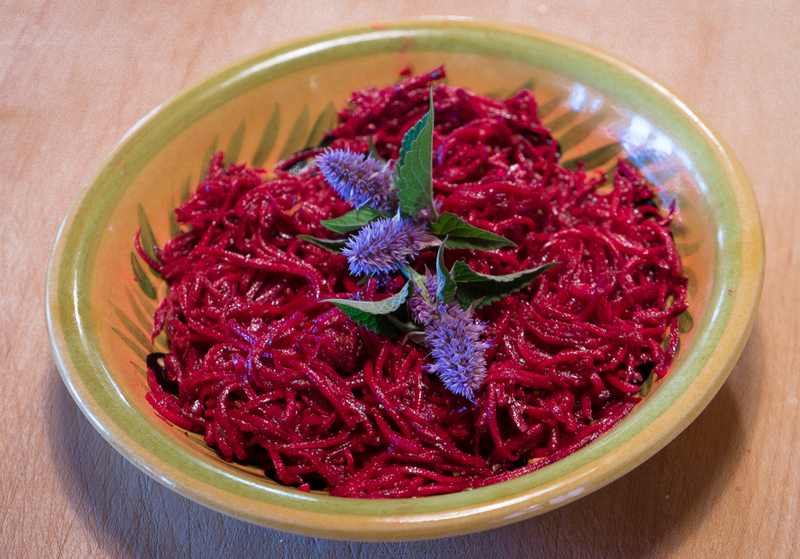 This 2010 recipe for Grated Raw Beet Salad from Martha Rose Shulman is quick and delicious. Fresh ginger or ground cumin are also good additions to this dressing. 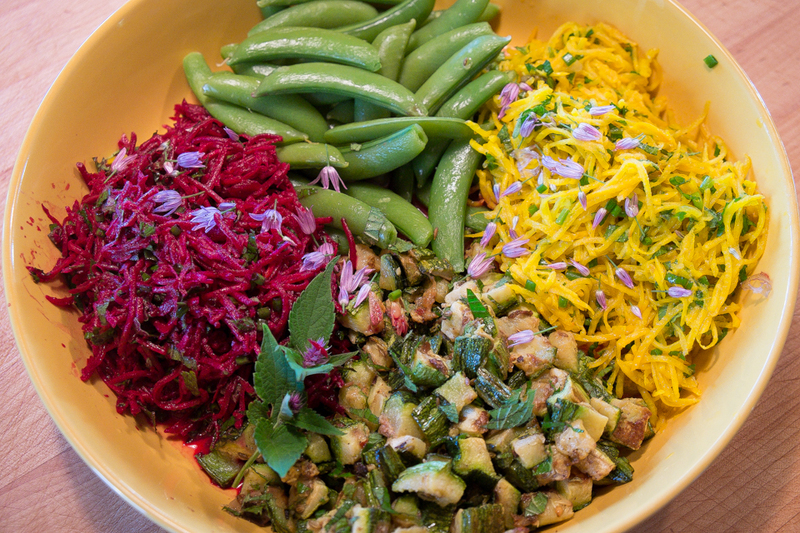 To take to a dinner party, I made one salad with red beets and another with yellow and added them to a platter of roasted zucchini and the last of the sugar snap peas. Pretty and fast. And for one more treat with grated beets I made Nigel Slater’s grated beets and ground lamb burgers. The burgers were moist, as Slater promised, and especially flavorful, smelling wonderful as they grilled and tasting even better. The yogurt sauce added a touch of acidity to balance the sweet lamb and sweet beets. 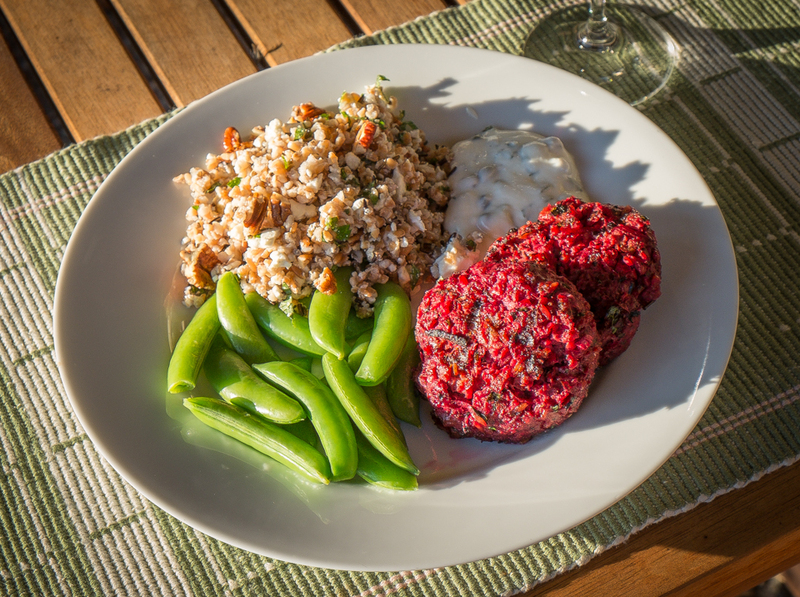 I didn’t go so far as to serve grated beet salad with these beet and lamb burgers but maybe next time. There are still beets in the kitchen garden. Peel the beets and onion and grate them coarsely into a large bowl. Add the ground lamb, garlic, dill, parsley, and a generous grinding of salt and black pepper. Squeeze any water from the cracked wheat with your hands and add to the meat. Mix everything together thoroughly, then form the mixture into patties. Chill for at least an hour. Make the dressing by grating the cucumber coarsely and leaving it in a colander, lightly sprinkled with salt, for half an hour. Squeeze it dry, then mix it with the chopped mint, capers, and yogurt. Season to taste with salt and pepper.